It can get quite boring for children to learn to read when all you use to teach them with are flashcards and worksheets. Children need to learn in a variety of ways. We’ve all heard of Gardner’s Multiple Intelligences and the modes of learning. So let’s make learning fun by using the five senses. Make a collage or mural of the letter or sight word. Search for certain words in the book or passage. The words could be your child’s spelling words or words that contain a certain spelling pattern. For example, your child could find all the –ight words and write them all down on a chart. Sing letter songs and sight word songs. Buy them or make up your own by putting the words into your favourite tune, for example, this is sung to the tune of Mary Had a Little Lamb: There are three letters in the, t-h-e, t-h-e. There are three letters in the, and that’s how you spell the. Recite letter and sight word poems and rhymes. Use different voices to say the letters or words, such as saying it in a happy voice, in an angry voice and in a squeaky voice. Read the book or passage as different characters, for example, first read it in a normal voice, then in a Donald Duck voice or a robot’s voice (or whatever voice your child can imitate). Or read it how his favourite character would. Do a reader’s theatre where your child performs by using vocal expression as he reads scripts. Cook something that starts with the letter your child is learning, for example, popcorn for the letter p.
Smell hunt for things that start with the letter your child is learning, for example, basil for the letter b. Taste test food that starts with the letter your child is learning, for example, apple, apple pie and apricot for the letter a. Talk about the differences in taste between an apple and an apricot, then about the differences between a fresh apple and its cooked product. Explore the different textures of things beginning with the letter your child is learning. Write the letters or words in sand. Make sandpaper letters or words and have your child run his finger along it. These are some of the things that your child can do to help with reading. Just remember that flashcards and worksheets do have their benefits but not every time. If you hear your child moan when you bring out a worksheet then you’ll know that it’s time to switch to a different type of activity. 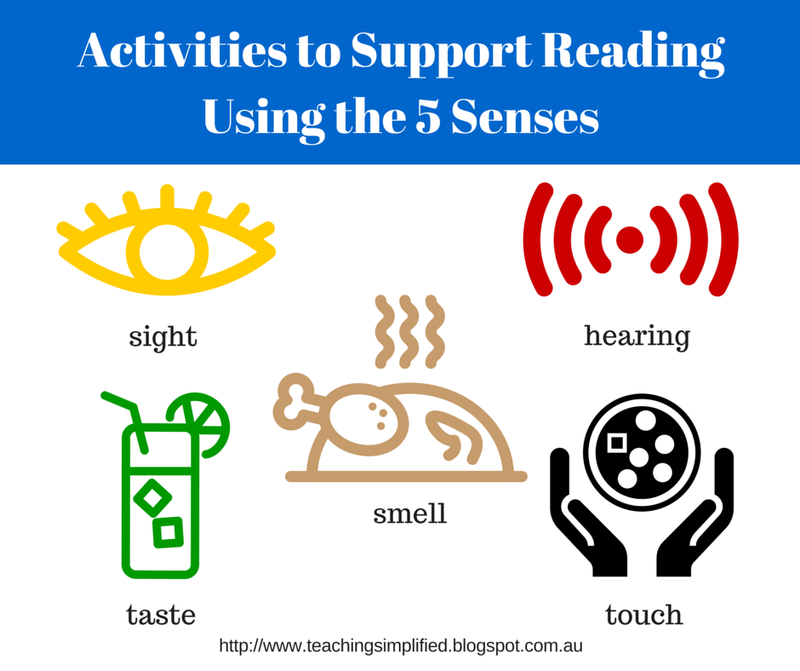 Using the five senses is one way to support your child's reading development, to read about the other ways read my full article here. To download an infographic of the 7 Ways to Support Your Child's Reading click here.